Pak Sheung Chuen manages to produce works that, against all odds, are recognizable as art. Emphasizing its intimate relationship with daily life by engaging with everyday situations and common people, his art is almost invisible, almost impossible to document, but manages to explore the human condition in all its complexities and with loving precision. Born in 1977, Fujian, educated and living in Hong Kong, Pak works with installations, photo, painting, video and perhaps fore mostly actions—continuing and expanding a conceptual tradition with both Western and Asian roots. As an artist who has matured in terms of methodology, he focuses on the realities of everyday life, revealing the uniqueness that enables the exploration of its uncharted potentialities. Consequently, these potentialities of everyday life, suppressed by the grand narratives of modernity, become the center of artistic expression and assume new meanings. Viewed under this light, Pak works from a state of suspension and ambiguity that subtly subverts the balance of power between different systems. Rich in the articulation of ambiguities, Pak's work is not for the market, not for the media, but for everyone who cares about discovery. I hereby congratulate Mr. Pak for winning the 2012 CCAA Best Artist Award. 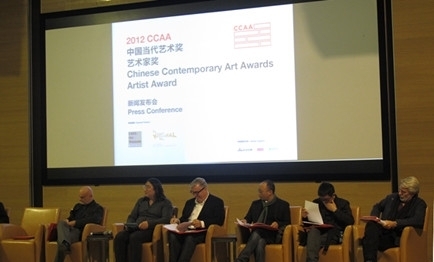 The members of the jury (CCAA2012) consist of internationally renowned experts on contemporary art. They are Carolyn Christov-Bakargiev (curator of documenta 13, Kassel), Chris Dercon (director of Tate Modern, London), Feng Boyi (artistic director of He Xiangning Art Musuem), Huang Zhuan (Director of OCT，Shenzhen), Li Zhenhua (independent curator) , Lars Nittve (director of M+ Museum of Visual Arts, Hongkong) and Uli Sigg (founder of CCAA).